I began and left unfinished several postings since my last one on June 24, not because I wanted to not post them but because I judged them unfinished, not up to my standards. 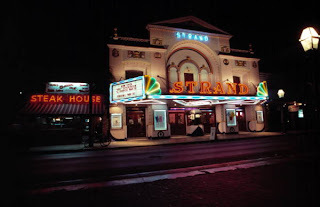 The venerable Strand theater on Duval Street has always fascinated me, though much less so since Walgreens's Pharmacy leased the building and put in a mini-store with no pharmacy and a smaller inventory than a typical store, such as the one on Roosevelt Boulevard. This page is from a site called Cinema Treasures, dedicated to Theater Preservation and Awareness. The theater was being operated as Ripley's Believe it or Not "Odditorium" when we arrived here in 1999. When we came back in 2004 it was being converted into Walgreens. Interesting post, thank you. When I first came here in 1970 this theatre and another one on Duval St. were both faded ladies of a bygone era, showing the "adult films" of the time. Then for a while both became night clubs with varying degrees of success. When the Walgreens to Ripleys transition came, even the powers-that-be, to their credit, saw to it that the facade was preserved. Changing demographics, changing economics, at least the facade is still there. Yeah. I remember it being closed down, then the Ripley's, and then I was shocked to see it was a Walgreens. Walgreens on Duval has a full service Pharmacy (M-F) at which I receive my monthly Rx needs from one of the most skilled and friendly pharamcists I have ever dealt with! Oops! I meant Ripleys to Walgreens above, not the opposite. I thought they had a pharmacy there. When the issue came up to change it to a Walgreens, I remember their spokesman saying that it would be full service, etc. A lot of people couldn't understand how it would be a "go." There was still a Rite Aid up the street. But they said they had done a marketing study and were sure that it would be profitable. Looks like they were right. Well, actually, it's a CVS rather than a RiteAid, but there are now three full-fledged "drug stores" in the first ten blocks of Duval Street, including the one just around the corner on Truman Ave.
A tenant works at the CVS on the 100 block of Duval St. He tells me that it's immensely cash-flow positive, and it doesn't have a pharmacy either. The one on Truman Ave. does.